One performer. One audience member. A one-of-a-kind aural experience. 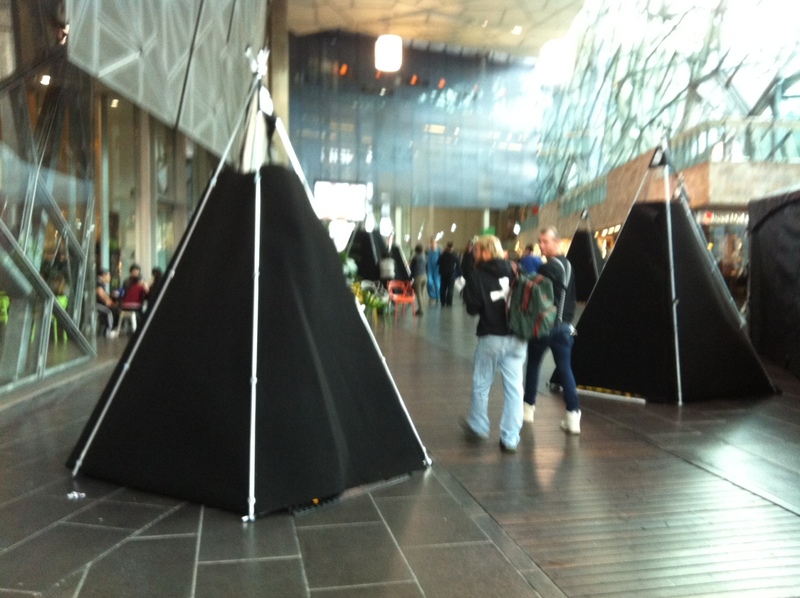 For the opening weekend of the Festival, a gathering of black teepees will congregate in Federation Square’ Atrium space, each big enough for just two people. Within each, a brief work of sonic performance unfolds, a work solely for you – the only other person in the room. This is a collectively devised work that embraces the spirit of community. The Sonic Flock is an experiential aural exhibit with a decidedly intimate twist – a free-form, immersive art experiment with a rotating roster of almost 30 local and international performers. At the end of each of the weekend days, larger scale, more communal performances take place. Saturday features Shadow Tales, performed by Footscray Community Arts Centre’s Amplified Elephants in partnership with theatre company Rawcus, while on Sunday three acclaimed Japanese sound artists feature in Extremities. An excursion into the fusion of shadow play by physical performers and synthesized electronic audio. Prepare to be transported. By RAWCUS Ensemble and the Amplified Elephants. Sonic art at the extremities by some of Japan’s most dynamic audio and audiovisual artists. We welcome these engaging artists to our shores: Masayuki Kawai’s video and audio feedback transformations; Pardon Kimura’s retro audio electronic remappings; and Cal Lyall’s hydro phonic sound worlds. During the day on Sunday 13 October large tents will house an installation by these artists and at night they will put on a show!